Current conditions provided by meteoblue. 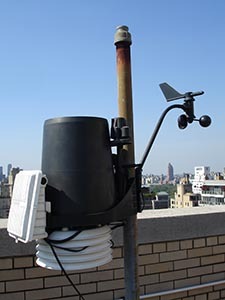 Learn about detailed weather conditions at Hunter College or view daily tabular data collected from our weather station. This Davis Instruments Vantage Pro Plus2 station continuously streams data to a computer in the Hunter College Climate Lab. For more information, contact Professor Allan Frei at afrei@hunter.cuny.edu.